Hortus Camdenensis | Diosma ericoides L.
Frost tender, twiggy. evergreen, heath-like shrub with crowded, blunt leaves and small white flowers, tinged red on the outside, typically in twos and threes and borne in great profusion in terminal clusters in spring. To 90cm. [RHSD, Hortus]. ‘From the leaves of this shrub the Hottentots prepare a powder which they call Baku; with this powder mixed with grease they anoint themselves for the sake of the perfume. 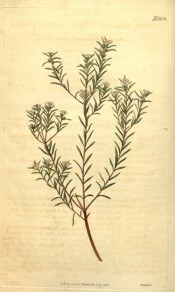 It is supposed that the Hottentots use for this purpose indiscrimately the leaves of several species of Diosma; but the powder prepared from one particular kind is said to be much more highly prized than the rest; in so much that a very small quantity, tless than a thimble full, is said to be of the value of a sheep. As the leaves of Diosma ericoides possess a stronger, more fragrant and aromatic quality than perhaps those of any other species, it is probably the very one that is thus highly prized. As both Bergius and Thunberg describe the leaves of their plant as obtuse, which, in the Hortus Cliffortianus, are said to be acute, it is probable that these authors described a different species; on which account we have entirely omitted the synonym of the former, and marked that of the latter as doubtful. Native of the Cape of Good Hope. Requires to be protected from frost. Cultivated by Mr. Philip Miller in 1756. Flowers from March to September. Communicated by N. Hodson, Esq. from the Botanic garden at Bury St Edmunds.’ [BM t.2332/1822]. ABR pl. 451/1807. Listed in all published catalogues [T.386/1843]. Diosma many species was ticked in a copy of the Horticultural Register, April 1832. Although this originally belonged to James Bowman, it is likely that species of this plant was grown by Macarthur earlier than 1843. This identification is somewhat doubtful as the name Diosma ericoides has been used for a number of similar and related but distinct plants, including species of Coleonema. For example, the plant figured in Curtis’s Botanical Magazine under the name Diosma ericoides Sims is D. vulgaris Schlecht. var. longifolia. [RHSD]. However, this is the plant used to illustrate this enty. Diosma ericoides Lam. (1786) = Diosma aspalathoides Lam. More details about Diosma ericoides L.